Any amount is welcome. However every donation of $10 USD or more and you'll recieve a personal postcard from wherever we are. We met these two on a bus from Cambodia to Vietnam and travelled with them througout Southern Vietnam. I met up with Pete in Singapore. We travelled through Singapore, Malaysia, Thailand and Laos together. We found these guys in Vava'u, Tonga. They're sailing their own boat around the world. Amazing. 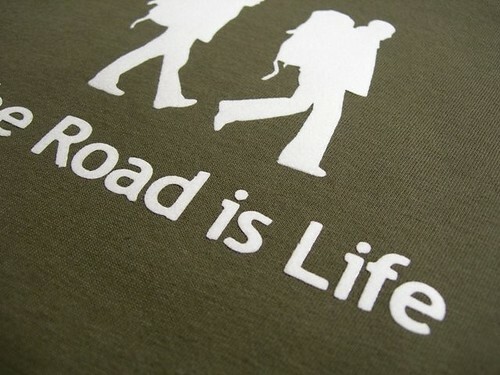 Just before I left on this circumnavigation, a friend made up a 'The Road is Life' T-shirt as a going away present. As soon as it began appearing in some of my photos people started asking to buy one for themselves. Now is your chance. $30 CDN + Shipping. I think the price is steep too, however I hope that you find comfort in the fact that we´re using the best quality we can find and the shirts are sweatshop free. My margins are lower than you think. A high quality white graphic on Navy, Royal Blue, Black, Red, Orange, Asphalt, Kelly Green, or Brown American Apparel shirt. 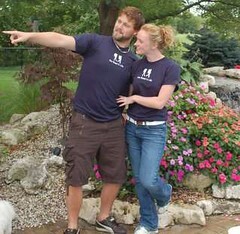 Choice of size (S, M, L, XL, 2XL). See an actual shirt; front and back. 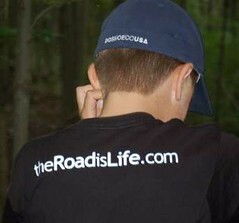 E-mail my good friend Jon at theroadislife@gmail.com to order the shirts. He'll take care of you. Specify colour, size, and shipping address to get full price (including shipping). Payment will be accepted through PayPal using a PayPal account or any major credit card. Note: Shirts are made to order, and not all colours are stocked. Expect 1-4 weeks delivery. If you have any questions, please contact Jon directly at theroadislife@gmail.com . Thanks for your continued support.